Welcome to the Burgundy Breakdown, which recaps the latest week in action featuring the Colorado Avalanche. After their home OT loss to Calgary, the Avalanche returned to the road this past Tuesday with a trip to Madison Square Garden to face a Rangers team on a shaky start to the season. The Avs went to OT for the second straight game, as regulation ended in a 2-2 tie, but this time, nothing was scored in the extra frame, leading to a shootout. The Avalanche lost the shootout and the game, with Mikko Rantanen scoring the only Avs shootout goal of the evening (and, as of this article, the season). The Avalanche went to “the Rock” to face the Devils, and after trailing twice, with the latter deficit coming in the middle of the third period, Colorado netted three goals in the remaining regulation time, resulting in a 5-3 victory. The game marked the first time that Nathan MacKinnon did not score, but Gabriel Landeskog picked up his third hat trick of his career–scoring once in the second and twice in the third. On Saturday, the Avalanche went down south to Raleigh for a meeting with the Hurricanes. Landeskog’s hot streak continued, as he scored in the first and second periods to give the Avalanche a 2-0 lead. MacKinnon scored in the third, and while Phillipp Grubauer’s shutout bid ended with over two minutes left, the Avalanche still held on and won by a score of 3-1. The Avalanche hot start to this season continues, as the regulation loss in Columbus still stands as the only one of the season. Landeskog scored five goals in two games, MacKinnon is still putting pucks in the net at rapid pace, and Mikko Rantanen is racking up helpers; he had three and a goal in the game in New Jersey. The Avalanche will remain on the road on Monday, as they will face off with the Flyers in Philadelphia. After that, the Avalanche will host the Tampa Bay Lightning this Wednesday on NBCSN, and Friday will see the team host the Senators, marking the first game in Denver for former Avalanche player Matt Duchene since he was traded last November. On Saturday, the Avalanche will head to Minnesota for the second meeting of the season against the Wild. That’s the Burgundy Breakdown! Until next week! The NHL is back and so is the Burgundy Breakdown! Welcome to the first edition of the 2018-19 season, which recaps the latest week of action featuring the Colorado Avalanche! The Avalanche opened the season at home against the rival Minnesota Wild this part Thursday. The Wild opened the scoring in the first period with a goal from Mikko Koivu, but Carl Soderberg tied things up later in the period with the Avalanche’s very first goal of this new season. It was 1-1 after 20, and in the second frame, Nathan MacKinnon gave the Avs the lead with the period’s only goal. Colorado netted a pair of empty netters in the third period, with Mikko Rantanen and J.T. Compher scoring the goals and sealing a 4-1 victory for the Avs. The Avalanche remained at home on Saturday with the first of two meetings with the Flyers, a battle between the last two teams to lock up playoff spots last season. Colin Wilson scored 1:35 into the game, giving the Avs the 1-0 lead, only for Sean Couturier to tie it up later in the period. Compher’s second goal of the season gave the Avalanche a 2-1 lead after one period of play, but Philly tied things up early in the second. Captain Gabriel Landeskog gave Colorado their third lead of the game later in the frame, and late third period goals by Wilson and MacKinnon ended up giving the Avs a 5-2 victory. As we all know, the Avalanche are coming off an amazing season that saw the team improve from their disastrous 2016-17 campaign. Last season, Colorado nearly doubled their point total and made a late run that put the team into the Stanley Cup Playoffs, where they lost a six-game opening round series to the Nashville Predators. With the team’s huge and quick turnaround, Avalanche fans were left wondering where the team could go from that point. How will they start? Where will they end up? The second question will take some time, but as for the first question, a 2-0 start is definitely a good step. Even better: both wins came against fellow playoff teams. The Avalanche’s second week of play will begin on Tuesday, with a trip to Columbus to face the Blue Jackets (another playoff team from last year). The team will head to Buffalo on Thursday to face the Sabres, and will return home on Saturday for a game against the Calgary Flames. Duelly Noted: Are the Blues Ready for 2018? The St. Louis Blues are a team that has something to prove after narrowly missing the playoffs in the 2017-2018 season. After such a dismal outcome, Blues fans were pining for a big change of some kind but fan expectations for that change were low. This off-season, Blues GM Doug Armstrong has pulled off some huge moves that can make the Blues dangerous going into the 2018-19 run. It all started with some moves that made it seem like the Blues were content with what they had but wanted to fill some holes. The Blues wanted a center and they found one in Tyler Bozak. He now has a deal with the Blues for 3 years at $1.5 million He got 11 goals with 32 assists in 2017 with the Toronto Maple Leafs. After a draft that did not lead to much big news for the Blues this signing garnered something of a mixed reaction from fans as Bozak was not the big signing or trade they hoped for. They assumed the Blues would be done after signing Bozak and the small move of re-acquiring David Perron following his run as a Stanley Cup Finalist for the Vegas Golden Knights but the best was yet to come. The Blues most shocking move this off-season was trading for Ryan O’ Reilly in exchange for Patrik Berglund, Vladimir Sobotka, Tage Thompson and a first round draft pick. Ryan O’ Reilly had a great year with the Sabres last season with 24 goals and 37 assists. O’ Reilly coming to the Blues made the hockey world sit up and take notice because nobody saw it coming. If Ryan O’ Reilly can manage to put up similar or better numbers this season, he can help make the Blues a really tough team to beat. The last big move the Blues have made is acquiring left winger Pat Maroon. Maroon has a $1.75 million dollar contract for one year. The Pat Maroon signing is an extra special one for the Blues because Maroon is originally from St. Louis and he gets to play close to his family. In the 2017-2018 season, he had 17 goals and 26 assists with the Edmonton Oilers. After years of either missing the playoffs outright or making early exits, Doug Armstrong took what appeared to be a dull off-season at first into a fun and interesting one for the Blues and their fans. It does come with the price of Carter Hutton leaving the Blues for the Sabres but on paper, the positives outweigh the negatives. All the Blues have to do is be ready to execute come October. Welcome to the latest Stanley Cup Playoff edition of The Burgundy Breakdown, which recaps Game 6 of the Colorado Avalanche’s series against the Nashville Predators. The Avs stayed alive thanks to Andrew Hammond’s stellar goaltending and late goals by Gabriel Landeskog and Sven Andrighetto in Game 5. They were looking to continue the momentum at home in Game 6, but the Avs got off on the wrong foot in the first period. In the first frame, Mattias Ekholm and Austin Watson both scored for the Preds, giving them a 2-0 lead after the first 20 minutes. It became 3-0 when Filip Forsberg scored yet another unassisted goal within the first minute of the second period. Later on, Nick Bonino, who scored the Preds’ controversial lone goal in Game 5 and assisted on the first period goals, netted one in the second, making it 4-0 and giving Bonino a three-point game. 4-0 was the lead after 40, and Viktor Arvidsson’s goal in the third made it 5-0, which stood as the final score. So with that loss, the Avalanche were eliminated, and Nashville advanced to the Central Division Final against the Winnipeg Jets. For the Avs, though, this was a spectacular turnaround for the team. Going from 48 points last season to 95 and a playoff spot this season has to be one of the biggest turnarounds in NHL history. It drew comparisons to MLB’s Minnesota Twins, who lost 100 games in 2016 and reached the postseason in 2017. Even in a series loss, the Avalanche defied odds, as many had them being swept by the defending Western Conference Champions and the current holders of the Presidents’ Trophy. However, the Avalanche didn’t make things easy for Nashville. They scored 15 goals in the six games played. They scored first in three of the six games played. They won Game 5 after being behind in the final five minutes of regulation; the first time any team won a playoff game in such a situation since the Chicago Blackhawks did so in Game 6 of the Stanley Cup Final in 2013. Regarding personal stats, Nathan MacKinnon’s six points (3 G & 3 A) in the series gives him 16 career playoff points (5 G & 11 A). Gabriel Landeskog scored four of the team’s 15 goals in the series, including two on the power play, and Mikko Rantanen had four helpers, but no goals as of yet. 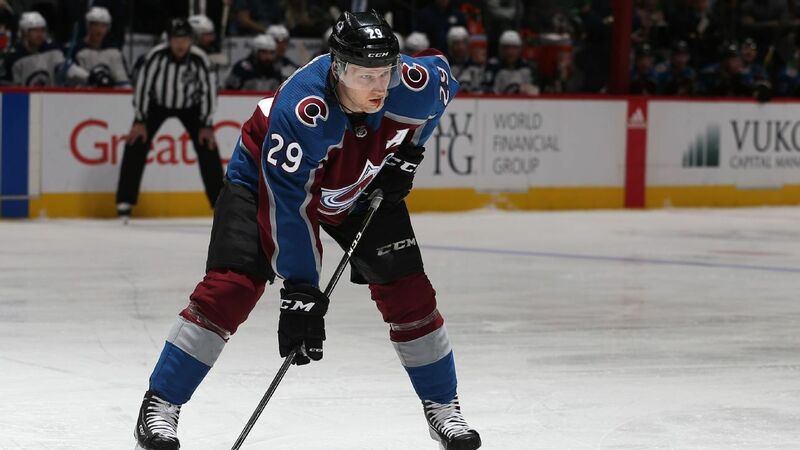 This writer believes that Rantanen will have plenty of chances to score his first career playoff goal, as the Avalanche could become a perennial playoff team once again. And that is the Burgundy Breakdown! It was a fun and terrific season; here’s to 2018-19! Welcome to the latest Stanley Cup Playoff edition of The Burgundy Breakdown, which recaps Game 5 of the Colorado Avalanche’s series against the Nashville Predators. The Avalanche looked to even their Central Division Semifinal series at home, but despite a third period comeback, the Avs came up short in Game 4 and only picked up a split, leaving the team facing elimination on the road. Colorado looked to Andrew Hammond to keep the team alive, and he was spectacular in the first period of Game 5 in Nashville. Nineteen shots were recorded, with 11 of them belonging to the Preds, but Hammond shut the door and the first 20 minutes ended scoreless. The second period saw more chances from both teams and close calls from end to end. Hammond continued to stay strong in the face of pressure, including a golden chance by defenseman Roman Josi, but even after 40 minutes, it was still scoreless. The entire series had at least one goal in the previous 12 periods; the first two of Game 5 were the first to not have any goals. All of the action happened in the second half of the third period, beginning with a highly controversial goal scored by Nick Bonino. Despite the video replay showing a clear distinct kicking motion, the officials reversed their original “no goal” call and awarded the goal to Bonino, putting the Avalanche down 1-0. The pressure was now clearly on the Avs, as that goal further put them on the brink of elimination. However, the Avalanche would take over the final five minutes of regulation, beginning with captain Gabriel Landeskog tying the game after a clever move by Nathan MacKinnon to fake out Pekka Rinne. With time winding down, it looked like overtime was on the horizon, but a two-on-one breakaway resulted in JT Compher’s shot being stopped, but Sven Andrighetto got the puck and put it past Rinne, giving the Avalanche a 2-1 lead with 88 seconds left. The Predators pulled Rinne on the face-off, but their attempts to tie the game late were all stopped by Hammond, resulting in the Avalanche holding on and winning 2-1. Regarding the past four games, I have had an answer regarding what went right or wrong for the Avalanche, but as for Game 5, I honestly have to say that it was just one of those games. No goals in the first two periods, followed by Nashville scoring a controversial goal, and with time winding down on the Avalanche’s season, Colorado came back with two quick goals. I can say this, though: Andrew Hammond saved the Avalanche in Game 5, racking up 44 saves in Colorado’s victory. Landeskog’s goal was his fourth of the playoffs, while MacKinnon recorded his 16th career playoff point with the assist. Andrighetto’s goal was his first career playoff goal, and his first career playoff GWG. Now the Avalanche have earned a trip back to Denver, and an opportunity to put the Predators’ backs to the proverbial wall. Game 6 is Sunday night in Denver. Welcome to the latest Stanley Cup Playoff edition of The Burgundy Breakdown, which recaps Game 4 of the Colorado Avalanche’s series against the Nashville Predators. The Avs were looking to even things up in the Central Division Semifinals, but they are off to a bad start early. The team committed back-to-back penalties within the first two minutes, giving Nashville a lengthy two man advantage, but the Avalanche managed to kill the penalty. However, the Preds did manage to score first for the first time in the series, as Filip Forsberg made another one of his signature moves to put one past Jonathan Bernier, and that was how the first period ended, with the Avalanche down 1-0. It got worse for the Avs in the 2nd, as Colton Sissons made it 2-0, and not only did a Colorado power play fall flat, but Craig Smith left the penalty box and shot one past Bernier, making it 3-0. 3-0 was the score after two, and the Avs began the third shorthanded. The penalty was killed, and back-to-back Nashville penalties actually gave Colorado a 2-minute 5-on-3, which they capitalized on when Gabriel Landeskog ended Pekka Rinne’s shutout bid. Less than six minutes later, Alexander Kerfoot made it 3-2, leaving Colorado with plenty of time to tie it up and force OT. However, even with the extra attacker, the Avs couldn’t get that game tying goal, and when the horn sounded, the 3-2 score held up in Nashville’s favor. An additional note, the third period started with Andrew Hammond in net for Bernier, who left the game due to an injury, and it was announced that Hammond will start in net for Colorado in Game 5. This, for the most part, was not a well played game for the Avalanche. An argument could be made that PK Subban got away with interference on the play that preceded Forsberg’s goal, but even with that, Colorado’s play paled in comparison to the first three games. The power play has been an Achilles’ heel for the Avs in this series, as their only two goals were scored by Landeskog, and both of them came via the two-man advantage. Nathan MacKinnon was shut out completely for the first time in this series, with his only good chance hitting the crossbar in the second period. Game 5 takes place Friday in Nashville. Welcome to the latest Stanley Cup Playoff edition of The Burgundy Breakdown, which recaps Game 3 of the Colorado Avalanche’s series against the Nashville Predators. Down 2-0 in the Central Division Semifinals, the Avalanche were looking to get back on track on home ice, where they won 28 of their 43 games this season. The Avs got off to a quick start, with Blake Comeau scoring his second goal of the playoffs within the first two minutes of the game. Later on, Gabriel Bourque deflected Patrik Nemeth’s shot, sending it past Pekka Rinne and giving the Avalanche a 2-0 lead; their first two goal lead of the series. After a power play ended with no results, the lead became 3-0, when Nathan MacKinnon broke away after receiving Gabriel Landeskog’s pass, scoring past Rinne in the final minutes of the period. The Avalanche ended the first 20 minutes shorthanded, but they maintained a 3-0 lead. The Avs killed the rest of the penalty to kick off the second period, and it was in the period that MacKinnon netted his second goal of the game and his fifth career playoff goal to make it 4-0, as well as send Pekka Rinne to the bench. Bernier’s shutout bid ended with Ryan Johansen’s power play goal in the middle of the second frame, but the Avs led 4-1 after two. Colton Sissions made it a two goal game in the third, but Gabriel Landeskog’s awarded goal in the final minutes iced things for Colorado. Landeskog’s unselfish attempt to pass the puck to MacKinnon to get him the hat trick in the empty net led to him being tripped, and by rule, a penalty during a breakaway to the open net results in an awarded goal. Austin Watson scored very late in the third, but Nashville could do no more, and in the end, the Avalanche took Game 3 by a score of 5-3. The Avalanche played with the same intensity that they had in the first two games, but the one difference was their lack of mental mistakes. The mental mistakes were made by Nashville in Game 3, and that led to Colorado’s golden opportunities. Nathan MacKinnon has three goals in three games this postseason; he had two in the entire seven-game series against the Wild in 2014. For the Avs, this victory ended a 12-game losing streak against the Nashville Predators; their last victory came on March 28, 2016 in Nashville. More importantly, it brought the Avalanche back in the series, and they have a golden chance to even things up and earn at least one more home game. Game Four takes place Wednesday in Denver. Welcome to the latest Stanley Cup Playoff edition of The Burgundy Breakdown, which recaps Game Two of the Colorado Avalanche’s series against the Nashville Predators. The Avs were looking to rebound after their 5-2 loss in Game One on Thursday. Saturday’s game was one of two early games that took place, and like Game One, the Avalanche scored on their first shot. This time, it was Gabriel Bourque, a former Predator, who shot and scored past Rinne, with the assists coming from JT Compher and Colin Wilson. Nashville ended the first period on the power play, but the first 20 minutes also ended with the Avalanche up 1-0. However, Kevin Fiala scored just 61 seconds into the second period, and with three seconds left on Nashville’s power play, tying the score. Viktor Arvidsson and Ryan Johansen followed with breakaway goals later in the period, but Nathan MacKinnon’s third career playoff goal cut Colorado’s deficit in half. In a chaotic third period, Austin Watson scored while the Avs were avoiding being caught with too many men, giving Nashville their two goal lead back. Back-to-back Predator penalties gave the Avalanche a two man advantage, and on the 5-on-3, MacKinnon’s shot bounced off captain Gabriel Landeskog and went past Rinne, making it 4-3. The remainder of the power play time was killed off, and the Avalanche later pulled Jonathan Bernier for the extra attacker. Nashville’s clearing attempt saw the puck bounce off the wall and in front of the net, and it was Ryan Hartman who beat the Avalanche to the punch and put it in the empty net. Alexander Kerfoot kept things alive for Colorado with his first career playoff goal with 35.8 seconds left, but the Avs’ inability to get the puck out of their own zone sealed the team’s fate, handing them a 5-4 loss. In all, the Avalanche played better in Game Two than they did in Game One, including a strong third period. In two games, the Avs have scored six goals on Pekka Rinne, but their 2-0 hole is mainly due to mental mistakes, mainly giving up breakaways and committing too many penalties. The team’s depth is showing, as it’s not just the main players providing offense. Nathan MacKinnon has three points already, while Nikita Zadorov, Gabriel Landeskog, and Tyson Barrie have two points each. If the Avalanche continue this offense onslaught on home ice, where they’ve won 28 games, and keep the mental mistakes to a minimum, this could be a real series. Game Three takes place Monday evening in Denver. Welcome to the first Stanley Cup Playoff edition of The Burgundy Breakdown, which recaps Game One of the Colorado Avalanche’s series against the Nashville Predators. It was on Saturday that the Colorado Avalanche locked in the last remaining spot in the Stanley Cup Playoffs, and it would put them in a match-up against the defending Western Conference Champions, the Nashville Predators. Thursday’s Game One of the Central Division Semifinals marked the Avalanche’s first playoff game since April 30, 2014, and it started slow for the Avs at first, but it was late in the first half of the period that Nikita Zadorov opened the scoring with a shot past Pekka Rinne. The Avs drew back-to-back penalties on Nashville, leading to a brief 5-on-3 opportunity for Colorado. Though the power plays were unsuccessful, the Avalanche ended the first 20 minutes with a 1-0 lead. The last ten seconds of Colorado’s second PP were killed in the beginning of the second period, and it was minutes later that Austin Watson tied things up for the Predators. Less than two minutes later, Blake Comeau tipped Carl Soderberg’s shot past Rinne to give the Avalanche their lead back, but it would be short lived, as Craig Smith tied it up just 10 seconds into their first power play opportunity, and that’s where it stood after 2 periods. The third period was all Predators, mainly Filip Forsberg, who gave Nashville the lead and then added a second goal after going from end to end. Colton Sissons scored an empty-netter in the final minute, and the game ended with the Avalanche losing Game One by a score of 5-2. Despite the three-goal loss, the Avalanche played well for the first two periods, but it was the most important one–the third–that was their downfall. For the Avs, they have now lost three straight playoff games dating back to Games Six and Seven against the Wild in 2014. Nathan MacKinnon picked up an assist on Zadorov’s goal, giving him his 11th career playoff point. Zadorov’s goal was his first career playoff goal, while Comeau’s tip in gave him his second playoff goal of his career. Game Two takes place Saturday afternoon in Nashville. Welcome to the Burgundy Breakdown, which recaps the latest week of action featuring the Colorado Avalanche! The Avalanche ended the previous week with an OT loss in Anaheim, but the one point they picked up moved the team past the Blues in the playoff race. After a Blues regulation loss this past Monday at home against Washington, the Avs had a chance to move further ahead later that evening, but they fell to the Los Angeles Kings in regulation, 3-1. The Avs were off for two days, but the Blues were in action on Wednesday; facing the Blackhawks in St. Louis’ home finale. The Blues led 3-1 in that game, but the Blackhawks came back and tied it, and with 8.5 seconds left, Duncan Keith scored on the power play to hand the Blues a 4-3 loss that kept the Avalanche one point ahead. Despite this, the Avs again failed to move further away from St. Louis, as Thursday’s game in San Jose saw the team fall to the Sharks by a score of 4-2. One of Colorado’s two goals was a power play goal from Mikko Rantanen, which is a small feather in the team’s cap, as San Jose has the top penalty kill in the league, but the loss not only left the Avs with just one point in the three game California road trip, it would mean that the team would have to beat St. Louis in order to clinch the remaining playoff spot in the Western Conference. St. Louis’ 4-1 win in Chicago on Friday meant that in order to get in, the Avalanche had to win in regulation. The do-or-die head-to-head match-up took place on Saturday in Denver. The scenario was simple. Regulation win for Colorado puts them in, going to OT means elimination for the Avs. Samuel Girard kicked off the scoring for Colorado in the final minute of the opening period, and in the second, Barrie scored on the power play to make it 2-0. Jaden Schwartz picked up a power play goal of his own later in the period, but Nathan MacKinnon would score his 39th goal of the season to give the Avs their two-goal lead back. The third period saw back and forth action from both teams, with the Avalanche having odd man rushes on more than one occasion. With just over four minutes left in regulation, goaltender Jake Allen was pulled, but Jonathan Bernier continued to stop the Blues’ onslaught. Gabriel Landeskog finally took possession, and fired a shot all the way to the empty net, prompting a massive celebration as the playoffs were literally on the horizon. The Avalanche went on to defeat the Blues, 5-2, to clinch a spot in the Stanley Cup Playoffs. For the Avs, this was a huge turnaround; going from the worst record in the NHL last year, to the playoffs this year. The Avalanche improved by 47 points, nearly doubling their point total from last season (48 last year, 95 this year), and one of many factors behind the resurgence was Nathan MacKinnon. MacKinnon fell one goal short of 40 for the season, and nearly had a 100-point season, and his effort puts him in the conversation for the Hart Trophy. The only thing literally keeping Jared Bednar from getting the Adams Trophy this year is what Gerard Gallant has done with the expansion Vegas Golden Knights. This is the Avalanche’s first playoff appearance since the 2013-14 season. An amazing regular season is in the books for the Avalanche, and so is the last Burgundy Breakdown of the regular season. The Avalanche will face the Nashville Predators in the Central Division Semifinals, a team the Avs failed to defeat this season (0-3-1). Game One will take place Thursday in Nashville, and I will post single game recaps! Until then!